Organizes community events designed to foster dialogue and understanding amongst people of different spiritual and cultural backgrounds, to further interfaith education, or to celebrate diversity. These events have ranged from intimate goodwill interfaith prayers to large-scale, multi-day conferences. Provides information and resources about world religions to the community, primarily through the annual production and distribution of the Multifaith Calendar, a thoroughly-researched compendium of nearly 500 spiritual events and observances from 14 of the world's leading religions. 30,000 copies of the Multifaith Calendar are printed and distributed to homes, workplaces, and public institutions throughout North America each year. Collaborates with other local organizations and institutions to plan and carry out initiatives that enrich community life and help to alleviate common social issues such as food insecurity, homelessness and drug abuse. For example, the Greater Vancouver Food Bank, which was co-founded by members of MAS, presently provides assistance to 28,000 people suffering from food insecurity each week. Acts in an advisory capacity with regards to fostering welcoming workplaces and public spaces or mediating issues of religious sensitivity. In 2009-2010, for example, the Society helped to facilitate a dialogue between local faith communities and the RCMP Integrated Security Unit responsible for planning and implementing security policy for the 2010 Winter Olympics. As a result, several landmark policy accommodations were developed to help make the Olympic venues more welcoming for people of faith. At its heart, MAS' work is about educating the public about world religions and their potential to help nurture global peace and harmony. In a country as diverse as Canada, a positive and comprehensive spiritual awareness plays an essential role in creating and maintaining a healthy, peaceful, and co-creative society. 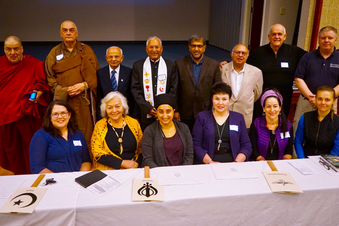 As Canada’s oldest interfaith organization, MAS has engendered and fostered this spiritual awareness for over forty years, and has played an integral role in creating a space in British Columbia where over 1 million immigrants can live fruitful and productive lives, free from fear of violence and persecution.